One of the reasons ExPO Signature Home Care will exceed your expectations is because our management, RNs, staff and caregivers offer you a wide range of choices in caregiving and home care services. We work with you in developing a care plan that suits the unique needs of the senior in your home. It is our vocation as caregivers to be compassionate and patient when providing senior care services to you and your loved ones at home. Our caregivers are specially selected to reflect our high ethical standards, as well as our objective of providing you with the most compassionate and effective care. When working with our caregivers you will find them to be experienced, honest, reliable, respectful, well-trained, and sensitive to your needs. All caregivers are bonded, certified assistants/aides who have successfully completed all required background tests. In addition, all of ExPO Signature Home Care caregivers are managed by caring and loving nurses who screen, train and motivate them, making them the best they can be. We put a great emphasis on providing the highest quality home care while simultaneously ensuring the safety and security of your loved ones. Our resident RNs have extensive hands-on experience in all nursing aspects. They have worked alongside doctors as well as with all medical office personnel in some of the most highly accredited medical facilities in the tri-state area. 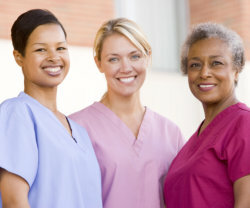 They have worked as post-op nurses, medical/surgical nurses, pediatric, OB/GYN office nurses and in the operating rooms. These RNs possess the expertise, experience and varied background that enables us to conduct a knowledgeable and thorough search for the best caregivers for your particular needs. Not only do they interview each home health aide, nursing assistant or companion personally and sets a strategy for each of our client, but they are also available to answer questions or concerns that arise while caring for the clients. In addition, these highly qualified RNs perform frequent site visits to the client’s residence to review the effectiveness of the care regimen.